With Christmas just around the corner, I couldn't resist sharing another old past blog post with your for Throwback Thursday. Why? Because this one is so much fun! In December 2014, I shared this howling good parody of the Mariah Carey hit song All I Want for Christmas is You. 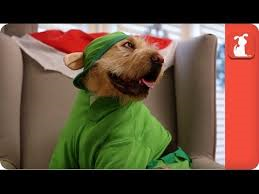 All I Want for Christmas is Food is parody from the dog lovers at The Pet Collective. In addition to more great pet themed parodies of popular songs, The Pet Collective offers entertaining memes, funny animal videos and even 24/7 streaming videos of puppies, kittens and other pets live. As I said then: Sit. Stay. Relax and enjoy All I Want for Christmas is Food from The Pet Collective. Scroll down below the music video for the lyrics so you can sing along. You can fetch more dog song music videos here at Talking Dogs. Every Saturday we feature original music written about dogs and the music videos are barking good! Do I want a breast or thigh? Is this macaroni 3 cheeses ? This all tastes so good! I shouldn't but I should! That was so cute! That scruffy little dog reminded me a bit of our Shelby.